The new Firewire interfaces in Echo's Audiofire range are based around their new Fireworks module, which is also available to other manufacturers as an OEM product. The Fireworks module combines industry-standard Texas Instruments Firewire chips with DSP technology, supports up to 12 simultaneous input and output channels at 192kHz and more at lower sample rates, has a built-in low-jitter clock and sync to external clock, and includes a digital mixer. Two Audiofire interfaces are available. 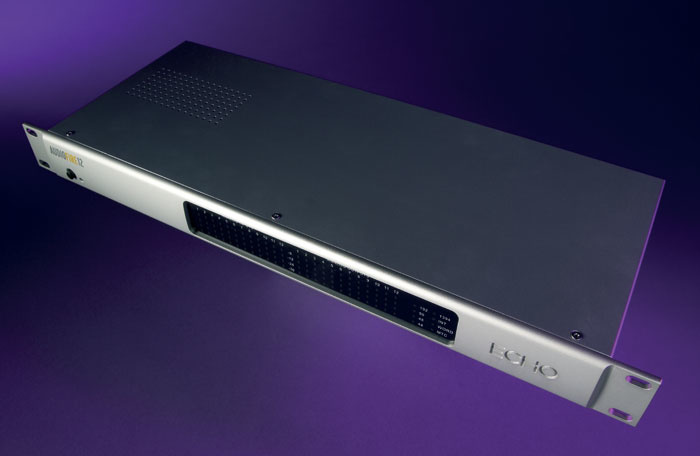 The Audiofire 8 is very similar in concept to Echo's Layla 3G (reviewed in SOS January 2005), with two universal mic/guitar/line inputs on its front panel and a further six round the back, along with eight analogue outputs, word clock in and out, MIDI In and Out, S/PDIF in and out, a pair of channel inserts and a dedicated headphone output. The only differences are that the Layla 3G provides an additional ADAT in/out and costs £430, while the Audiofire 8 has no ADAT capability and costs £500 — it seems there's still a premium to be paid for Firewire capability. For those who already have enough preamps and digital I/O but want more line-level analogue inputs and outputs, the Audiofire 12 has a much simpler spec, with 12 inputs and outputs on the rear panel, along with word clock in and out, MIDI In and Out, and a pair of Firewire ports, while the front panel simply sports LED meters for all 24 I/O channels, plus sample rate and status indicators. It's also the only one of the three that supports a 192kHz sample rate, and it retails at £650. The Audiofire 12 has an attractive milled-aluminium front panel with embossed Echo logo; unlike the Audiofire 8 and Layla 3G, the rack ears are integral rather than optional. Each of the 12 inputs and outputs has an identical LED meter with four segments at -36, -24, -12 and -6 dB, which provides just enough information to let you know there's a signal there, that it has low level, good level or is in danger of clipping. To the right of these meters are eight further indicators, which display the current sample rate, a valid 1394 host connection, internal clock, word clock, and the presence of MIDI Time Code. All 24 sockets for the analogue inputs and outputs are quarter-inch TRS-wired jacks for balanced or unbalanced use, while there are two BNC sockets for word clock, standard five-pin DIN MIDI In and Out, and IEC mains socket for the built-in mains power supply. The two six-pin Firewire ports are for connecting the interface to your PC and daisy-chaining other Firewire peripherals, although no parasitic power is available from these connectors for further devices in the chain. A front-panel on/off switch and power indicator complete this elegant yet understated interface, while the supplied Firewire cable is a generous 4.5 metres, the maximum length for reliable data transfer. A set of rackmount bolts and rubber feet is also provided. Sample rates: 44.1, 48, 88, 96, 176 and 192 kHz from internal clock; external clock range 32kHz to 192kHz. Analogue inputs: 12 quarter-inch TRS balanced/unbalanced jack sockets with individually switchable +4dBu/-10dBV sensitivity and 10kΩ impedance. Analogue outputs: 12 balanced/unbalanced TRS quarter-inch jacks with individually switchable +4dBu/-10dBV output level. Digital I/O: word clock and MIDI in and out. Dynamic range: input 113dBA, output 114dBA. Frequency response: 20Hz to 20kHz ±0.1dB. THD + Noise: <0.002 percent. The Audiofire range is designed to run on Windows XP SP2 or Mac OS X only, and I found the version 1.04 drivers on the Echo web site, along with a related firmware update. This update provides Gigastudio 3 GSIF2 driver support for PC owners, and adds 192kHz and OS X 10.3.9 support for Mac owners, while both platforms benefit from various minor enhancements. The current drivers support only a single Audiofire interface, but Echo promise to add multi-device support later on, and are already advertising this as a feature. The supplied CD-ROM contains a well written PDF User Manual and both PC and Mac versions of the popular Tracktion multitrack recording, MIDI and sampling package. This is a the full version of Tracktion 1, not just a demo, though it only supports sample rates up to 96kHz. 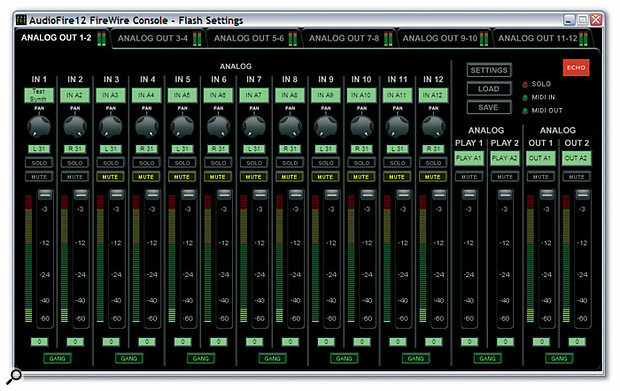 The Audiofire 12 Console gets installed along with the drivers, and is a considerable visual improvement over any previous Echo offerings, with large segmented level meters, and nicely rendered sliders and rotary knobs. Although initially confusing, the layout is actually extremely informative, and there's a separate but identical monitor mixer page for each of the six pairs of analogue outputs, chosen by clicking on the tabs across the top, or by using your F1 to F5 keyboard function keys. Each mixer page also has its own simpler pair of Play channels with mute button, fader and gang controls for the playback signals emerging from your multitrack music application, and an identical set of master controls that feed the combined mixer output to the physical output sockets. There's also a miniature version of each of the main analogue output meters on the tabs, so you can instantly see all 12 levels simultaneously across the top of the console. If you operate any of the Solo buttons on any mixer page, a solo indicator starts to flash on the right-hand side of the mixer, so that you're aware of this setting even when working on another mixer page where the soloed channel is itself invisible. In effect, what you get are six 14-in/two-out monitor mixing consoles, each one dedicated to a single pair of physical output sockets. To each pair you can send any combination of signals arriving at any of the 12 analogue inputs, with zero latency, as well as mixing in the related multitrack contribution. This is a very flexible approach, and means that you could, for instance, dedicate one or more pairs of analogue outputs to completely different headphone monitor mixes. Each input signal is also sent at full level to the appropriate driver input for recording in your sequencer, and by default each output pair hears both its sequencer playback signals and the related input channels. For instance, Analog Out 5-6 will hear whatever signals you route to the Audiofire 5 and Audiofire 6 outputs in your sequencer application, plus whatever signals you have plugged in to line inputs 5 and 6. However, you can create as many different mixer setups as you wish and save and reload them at will. As usual, it's recommended that you try to leave the Analog Play and Out faders at maximum to avoid losing digital resolution, only adjusting their levels for monitor-mixing purposes. The only thing you can't do is send all the multitrack playback contributions to the same analogue outputs to create a stereo monitor mix, although this can normally be accomplished from within your sequencer. I had no problems getting the Audiofire 12 up and running, but as soon as I plugged its outputs into my mixer I noticed something a bit weird: my mixer's -20dB 'signal present' LEDs lit up, suggesting that there was a continuous low-level signal being received, although nothing was audible when I turned up my speaker level. The only other time I've ever noticed this strange behaviour is with my Echo Indigo IO laptop interface, so there had to be a connection. It happened at every sample rate, and I eventually managed to track down the problem to the Audiofire's most unusual noise performance. Rather than the roughly flat noise spectrum one would expect, the Audiofire's output noise level starts to rise from about 25kHz, and when it got to the highest frequency I could measure (96kHz — half of the 192kHz sample rate) it had risen by a huge 70dB! When you choose the 176kHz or 192kHz sample rates, the Console utility input meters also display a continuous low-level input signal, and once I'd recorded some of this it turned out to be similar ultrasonic background noise. A swift email exchange with Echo's boffins confirmed that this noise isn't a fault at all, but a by-product of the rather unusual Cirrus Logic converters used in the Audiofire range, as well as in the 3G and Indigo IO. These particular converters use IIR (Infinite Impulse Response) filters instead of the more usual FIR (Finite Impulse Response) designs adopted by most competitors like AKM. Much research has been carried out to determine why many people hear an improvement in digital audio quality at 96kHz and higher sample rates compared with 44.1kHz, and many experts now seem to agree that it's not the extended frequency response that provides the audible improvements, but the gentler high-end filtering, resulting in better impulse response with less 'time smear' and cleaner transients. IIR filtering is more efficient, providing lower converter latency, and it also has a better impulse response, which according to the argument above should transfer some of the benefits of higher sample rates (better stereo imaging and improvements in playback of instruments with lots of transients, such as percussion) even to 44.1kHz recording/playback. The only disadvantage is this ultrasonic noise, if this is a disadvantage — you can't hear it, and the A-weighting filters used in dynamic range measurements automatically exclude it as well. I wouldn't have even known it was there except that my analogue mixer has a wide bandwidth with a -3dB point above 125kHz, while the Echo Console has no filtering at all, which is the only reason that it showed up on the meters. On other gear you might not even be aware of its existence. I was now most intrigued to audition these converters side by side with more traditional offerings, but was initially hampered by the fact that Echo's version 1.04 PC drivers didn't support WDM at all, so I couldn't perform my usual three-way blind listening tests using Cubase SX, which will only let you run several interfaces side by side if you choose the ASIO Multimedia or ASIO Direct X drivers. I couldn't run Rightmark's Audio Analyser either, and initially wrote a scathing paragraph on why WDM drivers are still so important to PC users for so many reasons. Thankfully, Echo came to the rescue by releasing version 1.05 drivers with stereo (but not multi-channel) WDM support a few days before I finished this review, enabling me to delete this paragraph and audition the Audiofire 12 using my normal methods. My auditions of the Audiofire12 alongside my own Echo Mia and Emu 1820M soundcards took a long time, simply because the results were so interesting. Having balanced their levels to within 0.05dB, I listened on speakers and under headphones to my usual wide range of audio tracks covering rock, dance, jazz trio, classical, solo drums and percussion, solo vocal, and special effects. Although the Mia provided a detailed and clear sound, it was easily outclassed by the much tighter imaging and greater front-to-back detailing of the other two interfaces, making it sound somewhat two-dimensional. I found I could tell the 1820M and Audiofire 12 apart fairly reliably, but it proved far more difficult to decide which I preferred. The 1820M provided an immediately impressive and spacious stereo image with good imaging and detailed reverberation, while the Audiofire 12's image was noticeably 'narrower' but with more pinpoint-precise positioning. Whether this was due to the IIR filters or a lower-jitter clock I wouldn't like to say, but overall I finally decided that the Audiofire 12 just pipped the 1820M to the post for its clarity and precision — the first interface I've heard that has done so. Rightmark's Audio Analyser roughly confirmed the manufacturer's specification, with a very good and almost identical measured 24-bit dynamic range of 110dBA at 44.1kHz, 96kHz and 192kHz sample rates, and a flat frequency response with -0.5dB points at 6Hz to 21.5kHz with a 44.1kHz sample rate, extending at the top end to 44kHz with a 96kHz sample rate, and staying about the same at 192kHz. Total harmonic distortion measured an extremely low 0.0004 percent, while stereo crosstalk was also excellent at -111dB. I had absolutely no problems running the MME-WDM drivers with Wavelab 5, but Sonar at first insisted that they were already in use, before eventually profiling them successfully, and thereafter glitching badly whatever the effective latency setting. I also found RMAA a little temperamental with the Audiofire 12 WDM drivers at 192kHz. However, the vast majority of people will be using the ASIO drivers, and these performed extremely well, running glitch-free on my PC right down to 1.5ms at 44.1kHz with both Cubase SX3 and Sonar 4. Meanwhile, NI's Pro 53 managed a slightly better than average 30ms Play Ahead setting with the Direct Sound drivers, and 45ms with the MME ones, while the GSIF 2.0 drivers worked fine in Gigastudio. I did notice on closer examination of my various 44.1/48kHz ASIO recordings that the first five or six milliseconds were muted, and there followed a tiny -55dB click lasting a couple of samples before the recording proper. This shouldn't really happen, although you're rather unlikely to notice it in real-world recordings, and above 48kHz the clicks completely disappeared anyway. Overall I suspect the WDM drivers still need a few tweaks, but the ASIO ones seemed rock solid. Echo have nearly always managed to make their products slightly different from everyone else's, and this new Audiofire 12 is no exception. The 12-in/12-out analogue design will appeal to any musician with ambitions to record and play back ambitious multitrack recordings, although I suspect some will look elsewhere when they notice that there's no digital I/O at all — even a single S/PDIF in and out would have been very welcome. I was certainly impressed by its sonic performance, and while I found it disconcerting to see the bottom couple of LEDs on my mixer's main meters permanently on due to high ultrasonic noise, the improvements in stereo image spoke for themselves. Echo told me that their production-line models now have 12dB less ultrasonic noise compared with the review model (at the expense of reducing the bandwidth slightly), which should remove these tell-tale signs of ghostly signals for good. If you want a Firewire audio interface with the more conventional eight-in/ eight-out+digital format and a selection of mic, guitar and line inputs then there are plenty of contenders at around £400, including Echo's own Audiofire 8. If you need to extend to 16-in/16-out+digital then you could run two of these boxes given suitable drivers, which will probably cost you around £800. However, with this 12-in/12-out spec and a £650 price tag there's nothing else quite like the Audiofire 12 for comparison purposes. Overall, Echo's Audiofire 12 provides excellent audio quality and lots of analogue I/O for the price, and as long as you don't need any digital I/O I can recommend it highly. This is an impressive piece of kit. Input and output meters for every channel. No digital audio I/O at all. Unusually high ultrasonic noise levels. No front-panel indication of 88 and 176 kHz sample rates. Current WDM drivers only support stereo operation. Echo's Audiofire 12 provides excellent sound quality and lots of analogue I/O, which should win it lots of admirers, but will not suit everyone due to its total lack of digital I/O, other than word clock and MIDI.